LazyMan Soil Doctor is a 10-3-6 liquid fertilizer that combines all of the best lawn treatments together in one convenient spray. 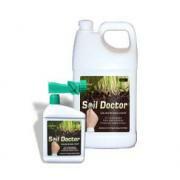 Why buy each product separately when you can purchase the LazyMan Soil Doctor? Outsidepride.com’s soil doctor provides liquid lawn aeration, lawn dethatching, lawn fertilizing, and soil conditioning for a beautiful and lush lawn after just a few applications! LazyMan Soil Doctor is the only spray of its kind, and Outsidepride.com is pleased to offer it up for sale in a variety of sizes to fit your needs, from a small single quart container to a large five-gallon jug. Are you ready to just spray and walk away? The lawn aeration portion of LazyMan Soil Doctor is a uniquely formulated high-grade non-ionic lawn aerator. It helps reduce crusting, loosens up hard clay and compacted soils, aggregates sandy soil, and allows water and oxygen to reach plant roots more easily by reducing the surface tension between the water and the soil. LazyMan Soil Doctor is designed to decrease the surface tension between water and soil while improving the growth and activity of the microorganisms that are necessary for a healthy soil environment. Using a lawn aerator is key to healthy grass growth, lawn treatment, and maintenance. It permits essential water, air, and nutrients to penetrate deep into the root zone, which in turn creates a more robust root system that generates thicker, greener grass. Plus, the enhanced functioning of the soil’s natural organic processes means that there is a reduced need for fertilization. Outsidepride.com wants to make sure that our customers never confuse the LazyMan Soil Doctor with any other products that claim to aerate the soil and claim to be a soil conditioner. LazyMan Soil Doctor is not a wetting agent, a surfactant, a penetrant, or polyacrylamide (PAM). Our LazyMan Soil Doctor is a liquid polymer mixture that loosens and aerates compacted soils, producing long-lasting results as compared to other products. Thatch is a layer of both living and dead grass stems, roots, clippings, and debris that resides between your green vegetation and soil surface. Depending on the amount of thatch present, it can have detrimental or beneficial effects on the area’s turf. Thatch buildup is commonly found in lawns where grass has grown tall, mulch is frequently left, and lawns that have never been aerated. The thatch layer is an ideal environment for pathogens and pests such as fungi and insects. Additionally, thatch tends to repel water, leading to hydrophobic soil conditions which require additional maintenance in the long run. Our LazyMan Soil Doctor contains a lawn dethatcher that works quickly to remove the thick layer of decaying plant material so that the necessary nutrients can get to the soil. Don’t worry if your lawn looks a little ragged after applying lawn dethatcher. Simply rake up the loosened thatch and discard. Outsidepride.com’s lawn dethatcher for sale has proven effectiveness under a wide range of conditions, reduces the need for other pesticide applications by half, and allows for better water and oxygen penetration in your lawn. Purchase your LazyMan Soil Doctor today to enjoy all of these benefits and more! A final component of the LazyMan Soil Doctor, its soil conditioner, offers biological, physical, and chemical benefits all wrapped in one. A soil’s health is central to your lawn and garden’s productivity — and the best way to achieve high-quality soil is through soil conditioning. The LazyMan Soil Doctor accomplishes this by increasing your soil’s water holding capacity and chemically improving its fixation properties while also stimulating plant growth. Outsidepride.com is the one-stop-shop for all of your lawn treatment products — from grass seed to lawn aerators and everything in between. We are constantly adding new and exciting lawn care items to our site so please check back frequently!